This article originally appeared in the . In 1947, San Francisco planners took a look at the Western Addition and shuddered. No neighborhood had higher crime, more poverty or worse living quarters - "murky cubicles, damp basements, rooms that are hardly more than closets." But, liberals that they were, they proposed grand schemes for replacing the neighborhood's "hand-me-down dwellings" with garden apartments and high-rises in a parklike setting. "Nothing short of a clean sweep and a new start can make the district a genuinely good place to live," the Redevelopment Agency avowed in its 1947 report. Enid Sales was the chief of residential rehabilitation for the San Francisco Redevelopment Agency from 1966 to 1976. Black ministers and some Japanese American residents worried that they would be replaced by upper-income white people. But no one argued that the Victorian homes - with spindles and scrollwork, bay windows and crowned turrets - that were to be demolished should be saved because of their utility or beauty. By the mid-'50s, bulldozers were clearing block after block. Meanwhile, an effort to restore the city's Victorians was getting under way. Its author? A dynamo named Enid Sales, whose only building experience was constructing sets on a television soundstage. Her qualifications? "My big mouth, I guess," Sales said, with a laugh. 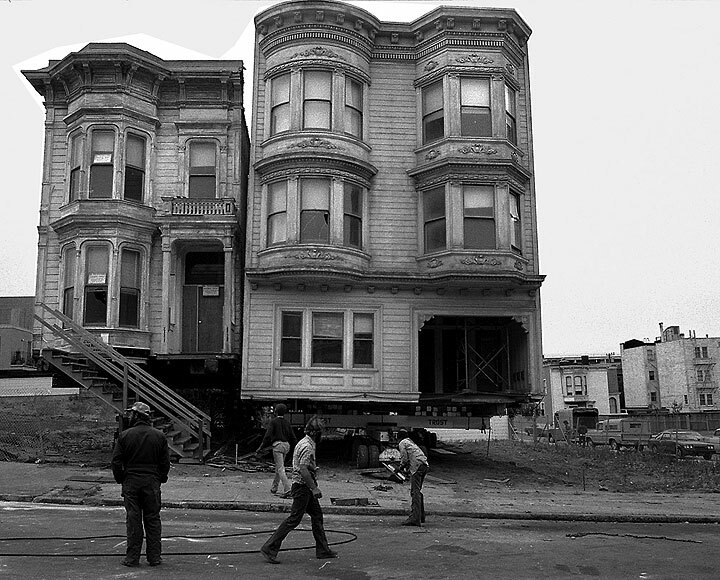 "I felt compelled to save San Francisco with my very own two hands," she announced at the 2006 conference of the California Preservation Foundation, which named her preservationist of the year. Former Redevelopment Agency official Carlo Middione describes the work of a key group, including Enid Sales, in the Agency to preserve some of the old Victorians in the Western Addition by getting them moved to new locations. In a career that has stretched for more than 50 years, Sales helped define the modern movement for historic preservation, both as a builder and as an advocate. Sales has restored dozens of historic homes in San Francisco, Healdsburg and on the Monterey Peninsula. She preserved more than 350 Victorians as head of the San Francisco Redevelopment Agency's residential rehabilitation program. She won instant fame in 1974 by trucking 13 of them across town. Today, historic preservation is a discipline, with university degrees available for architects, planners and administrators, and with hundreds of firms specializing in preservation planning, painting and landscaping. But in the 1950s, none of this existed, nor was there a National Trust for Historic Preservation, a National Register of Historic Places or environmental laws that help preserve cultural resources. So when Sales started renovating first one, then another Victorian home in the city, she had to wing it. 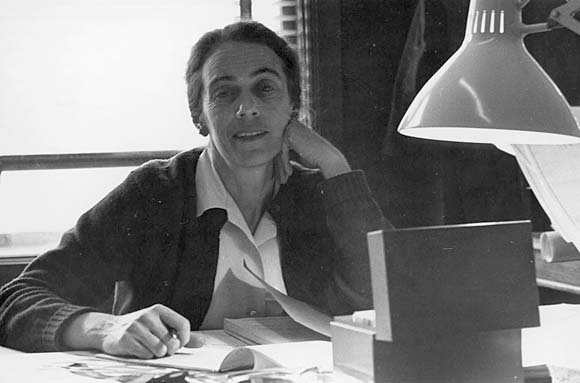 Enid Thompson grew up in Salt Lake City and Berkeley, studied literature at Reed College in Portland, Ore., and married the (later famous) jazz critic Grover Sales. By the late 1940s she was running Allied Potters, turning out dinnerware that sold at Gump's. She later founded a movie soundstage in San Francisco with her husband. Sales began renovating Victorians after her divorce, updating bathrooms and kitchens, redoing plumbing and electrical systems, adding decks and restoring facades and interiors by scrounging through salvage shops. She restored close to 2o homes. "I did quite a bit of the work myself. I knew how to do things. I wasn't this weak sister." During this time, after one client refused to pay her, Sales got her contractor's license - the first woman in the state to pass the test, she said - to make sure that would never happen again. By the 1960s, the city was rethinking its strategy of replacing every Victorian house in the Western Addition with suburban-style garden apartments. This was fueled by angry protests by residents facing eviction as well as a burgeoning sentiment for historic preservation. Historically minded architects persuaded the Redevelopment Agency to survey historic buildings in the Western Addition in the early 1960s, said Gee Gee Platt, who served on the city's first Landmarks Preservation Advisory Board, which started in 1967. In 1963, the Junior League began surveying the city's historic sites. In 1972, residents angered by the destruction of the Fox Theatre in 1963 and the loss of homes in the Western Addition created the Foundation for San Francisco's Architectural Heritage. The Victorian Alliance was born that year, too. Meanwhile, the National Historic Preservation Act of 1966 and the California Environmental Quality Act of 1974 put teeth into efforts to preserve historic architecture. Redevelopment created a residential rehab program to save some of the area's Victorians in 1966, and Sales was hired to help out. She was soon chief of rehabilitation, overseeing a staff of 20, including six architects. During the next 10 years, Sales and crew preserved more than 350 Victorian homes that today include some of the city's best-known streetscapes. Block after block of Italianate and Stick-style homes and duplexes, plus magnificent Queen Anne tower homes, exist today because of Sales. She and her crew surveyed the neighborhoods to see which homes could be rehabbed, then knocked on doors. Their offer? Low-cost rehab loans, with free architectural services and bidding handled by the Redevelopment Agency. Gay people have rightfully been credited with restoring many of the city's Victorians. But thanks to Sales, the mostly African American working-class population of the Western Addition beat them to it by half a decade or more. Sales strongly believed that clearing a neighborhood of its residents was wrong, and that renovation should benefit current residents. She says most people were eager to remain in their homes. "Those people were tremendously grateful," she said. "They used to bring me cookies and booze and everything." She remembers one gift that was particularly effective - bourbon balls. "The whole office went to pieces. I'll tell you they were strong!" "We were trying to save some of the houses," said Susan Bragstad, the lead architect on Sales' team, "and trying to keep people inside their houses." Their charge was to make the units habitable, not historically true. But, Bragstad says, "we did a little more." Their office on Fulton Street had a warehouse filled with balusters, doors, windows and more salvaged from demolished Victorians, which were called upon as needed. "It was one crisis after another," Sales said. At one of many contentious neighborhood meetings, Sales, who had been "warned to restrain herself," according to a newspaper report, sat none too quietly in the back row, "chain-smoking and gripping the chair in front of her," while locals raked her team as duplicitous and racist. They believed the Redevelopment Agency still intended to replace black residents with high-income whites. The high points, however, were many, including the auctioning off of a block of renovated Victorians that had would-be buyers lined up down the block. Noni Richen, who bought one of them with her husband, raised three children there and still lives there. "It was cute," she said, "it was a Victorian, and it was all fixed up on the inside." Architectural Heritage joined with Sales on her grandest project - moving 13 Victorians across town to save them from the wrecking ball. 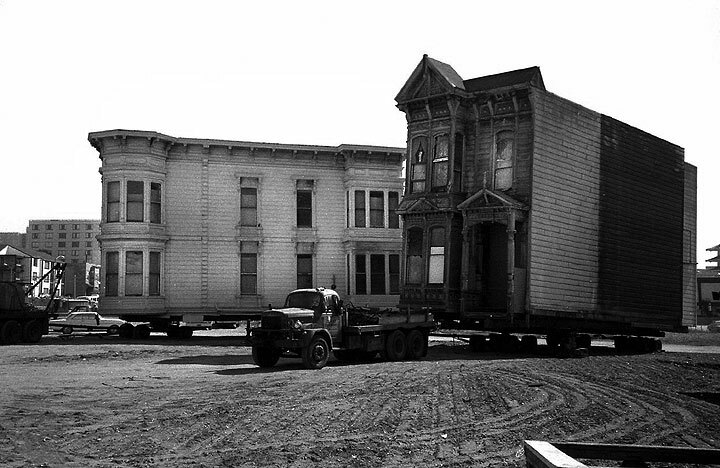 In the fall of 1974, the Victorians - including several that are now on the National Register - were hoisted onto flatbeds and moved, many to what is now the Beideman Place Historical District. "I want to tell you, moving those puppies around was a big deal," Sales said. The move happened late at night, so streets could be closed and power lines moved. But crowds cheered. "It's my baby," Sales told a reporter, as she walked alongside the trucks, "and I'm excited by it." In 1976-1977 Dave Glass took these remarkable photos of the Victorians on the move. But Sales eventually tired of the politics and quit the agency in 1976. She moved to 54 acres in Healdsburg for the life of a grape grower - Zinfandel and Pinot Noir. Bragstad designed for her a traditional farmhouse with wraparound porch. She remained in construction, building a few small houses and rehabbing perhaps 20 mostly Victorian cottages. Victorians restored by Enid Sales with the Redevelopment Agency can be spotted at the Bush Street-Cottage Row Historic District, including 1 to 6 Cottage Row and 2101 to 2125 Bush St. Many homes on Beideman Place and on Ellis and Eddy streets between Divisadero and Scott streets were rehabbed by Sales' team, including 1830-34 Eddy St., 1929-31 Ellis St. and 1209 and 1213-15 Scott St. Houses that Sales moved include 1735-37 Webster St.; 1813-17 Sutter St.; 1239-1245, 1249-51, 1321 and 1331-35 Scott St.; 33-35 and 45-47 Beideman Place; 1840-42 Eddy St.; and 1030 and 1040 Broderick St.